Elves have a lot of names A LOT OF NAMES. Often these names are significant and/or portentous. They can have three kinds of “Anessi”, given names. The first is the fathername (we dont have an actual word for fathername in quenya), given at birth. The second, amilessë, is the “mother name” and is given later in life. Mothers were thought to have insight, often prophetic, into their childrens character, so mothernames had a great deal of significance. Epessë, “afternames”, were names or titles of honor either granted to the elf or self chosen. There is a fourth kind of name, the Kilmessë, which is chosen by an elf once they are “capable of lámatyáve” which is to say “fluent enough to take joy in individual sounds and words”. This name was a private name, though not secret, and using it without permission was considered presumptuous or an insult. While Melkor’s names, as you will see below, are traditionally quenya and sindarin, he is actually the exception to the rule. The other Valar’s names, while often having both quenya and sindarin forms, are based on their names in YET ANOTHER language Tolkien invented, called Valarin. This language is BONKERS WEIRD. It barely counts as a “language” as Tolkien only really sketched out some words and a bit of structure but its cool to see. Fëanor: sindarin rendering of his amilessë, Fëanáro, meaning “spirit of fire”. 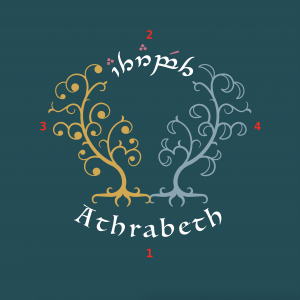 While the translation of Sauron as a quenya word meaning “The Abhored” is pretty consistent, the origin for this word went through a number of iterations over time. the elfdict entry for the word has a great rundown.